Work health and safety is a top priority at Voith GmbH. The technology group equips their latest Voith Training Center with modern extraction system and filtration technology. 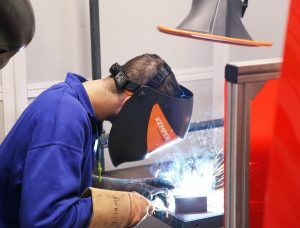 Despite a completely open plan building over three floors, the training center remains free of harmful welding fumes and grinding particles. Voith has invested 16 million Euro in the training centre at its headquarters in Heidenheim. 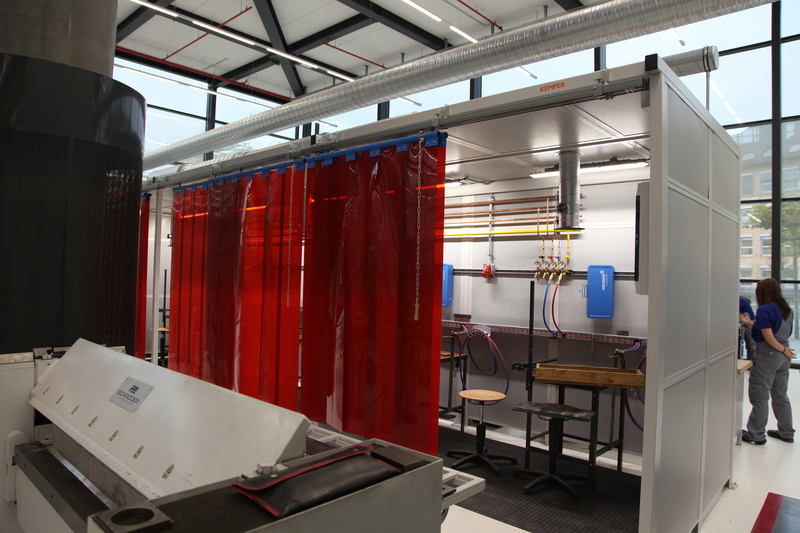 The three floors of the building are almost entirely constructed from glass and steel and are all open plan sharing the same air – whether it is the training rooms for specialists or welding rooms for trainees. A huge challenge for work health and safety, specifically for welding and grinding stations. Voith processes stainless steel in huge quantities. This creates the most harmful hazardous substances. Effective extraction systems and filtration equipment was installed on about 300 of the overall 2,000 square metres large training workshop on the ground floor. The heart of the system is a central extraction system and filtration plant which was setup in the basement of the training center. The plant is connected to the actual workstations in the workshop via a pipe system. A pre-separator system connected upstream from the plant ensures that sparks or coarse particles do not get into the filtration plan and do not put additional pressure on the filtration process. The plant even filters from the air carcinogenic nanoparticles below 0.4 µm, thus preventing serious respiratory diseases. 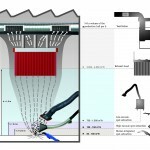 An integrated frequency converter automatically adjusts the volume flow – it no matter if welding occurs at one workstation or all of them at the same time. Constant, demand-based extraction performance is thus ensured at all times. Therefore, the automatic volume flow adjustment leads to significant savings in energy costs. The workstations themselves are divided into two areas: One is completely open plan, the other is separated by individual welding booths. In the open plan area two ten meter long extraction arms with cantilevers were integrated, which are connected to the pipe system. This provides trainees the greatest possible flexibility during welding even when working with larger workpieces. 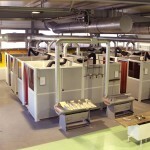 Nine welding booths were specifically integrated for MAG and MIG welding with high arc use. Every protected workplace has its own extraction arm which in turn is connected to the main extraction system and filtration plant. 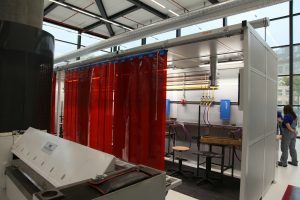 The welding booths are made of special soundproof walls and have sliding welding protection strips with an individual degree of overlap. The system also saves energy thanks to a two-way distributor. This allows Voith to work the system with both extraction air and circulating air. Ten months a year the system operates with exhaust air – also against the background that chromium-containing stainless steel is welded and Voith prefers to be on the safe side due to the highest hazard potential due to chromatic hazardous substances. Thanks to modern building communication, the system also enables energy savings in exhaust mode. In the past, building exhaust air and the exhaust air from the extraction and filtration plant ran parallel to each other. Today, building and process exhaust air are connected in such a way, that the building exhaust air stops once the process exhaust air starts. The plant also saves energy in recirculation mode. The already heated air is supplied to the Voith Training Center after filtering. Reheating is not necessary. Voith is a technology provider with its headquarters in Heidenheim an der Brenz. The portfolio includes plants, products and industrial services for the energy, oil & gas, paper, raw materials, transport and automotive sectors. Voith is represented internationally in more than 60 countries and employs more than 20,000 staff. 10,897 staff in Europe alone. The Group generated sales of 4.3 billion Euro in the 2014/2015 fiscal year.